I sat on the train, from York to Edinburgh. It was not the beginning of the journey. It was the end. I sat, listened to music and gave myself a headache. I walked off that train and into the chill Scottish night with eighty-nine names. Each name was different, unique but unified by a common culture and a shared heritage. Every one of those names was a character waiting to be fleshed out. I was giddy, excited and ecstatic. The headache was forgotten in the wake of such wonder. It was like opening presents on Christmas. Who would go where and do what? Which characters would stand in the foreground? Who would live and who would die? I stared at the names until my vision blurred and my mind raced. Naming is my favourite part of the writing process. It is the forming of letters and concepts into a new shape, granting insight into culture and personality. The naming of names is often the first thing I do when starting a new project. How can I write about someone if they haven’t got a name? They are fascinating things, names. They are windows into other worlds and other cultures. They reveal personality, family and a thousand other details. It may differ how we think a name is pronounced, but at the end of the day it is the name, that configuration of letters that linger. I do not have a unified process for the creation of names. I have a single rule of thumb that applies across all the names I have written. Would someone really be called this? I’ve tried to think of a better way to articulate this, but a name is a name. There is something, some quality, that makes the name fit and once established you cannot envision that character going by anything else. This might seem a strange notion for someone who writes Science Fiction and Fantasy. Names in these genres are often confusing jumbles of letters, symbols, accent marks and umlauts. Too many times have I come away doubting I could spell such a name, let alone pronounce it. Pronunciation of names, unless they are meant for something alien and inhuman, is another good rule of thumb. Can I pronounce this name? This is another question I ask as I set about crafting names from the ether. I could not see the names functioning for their purpose. Instead, I grow certain that the author pulled letters out of a hat and threw them together and deemed it good. This is something I attempt to avoid in my own naming process. Always, I ask the question, ‘Does this seem like someone’s name?’ The question is deceptively simple, but it was a question I asked eighty-nine times that night on the train. As I said before, I do not have a strict method for naming names. Sometimes I pick a letter of the alphabet and start from there. Other times I pick a word, an existing name or a culture and jump on. Every once in a while a name slinks forward from the dark recesses of my subconscious and into the foreground. These are names that demand to be heard. These are names that fit perfectly with what I am trying to evoke. There are rules and conventions that names follow in the real world, let alone in fictional ones. I try to keep the names of similar cultures and similar origins united by a common thread. Often, I keep open a list of names from real-world cultures or mythology and use that as a guiding light. I always ask, how do these names sound? How do they look? What letters are common? Writing for tie-in fiction is both a blessing and a curse for much of the same reasons. I am blessed in that the majority of the world building is already done. It already exists in the lore. An Ultramarine by any other name would not be an Ultramarine. This holds true for the eldar, the tau or the Raven Guard. The core elements of the names are already there. I already have a structure within which to work. This also acts as the curse. I am bound by that structure. To deviate, even by the slightest bit, is to upset the lore and to upset the fans. As a fan myself, long before I did any writing for the Black Library, I know how important the background is to the setting. With the names come flashes of personality, flashes of insight and imagery. One of the eighty-nine names was Sejen Faar. With that name came an image and a voice. It was deadpan, ruined and soft-spoken. The voice issued forth from a face of black metal and thus, along with the name Sejen Faar, came the beginnings of a character. Another name brought with it an object. Sikrun Talow carried something. I saw the name on the page and knew that he carried something from his past. A small glass knife, wrapped in leather and etched with a child’s initials reminded Talow of where he came from. Joe Parrino on Twitter, and Web. The next guest on the blog is Andy Smillie, and his post will go up on the 15th. You can find the full schedule in the link up top. 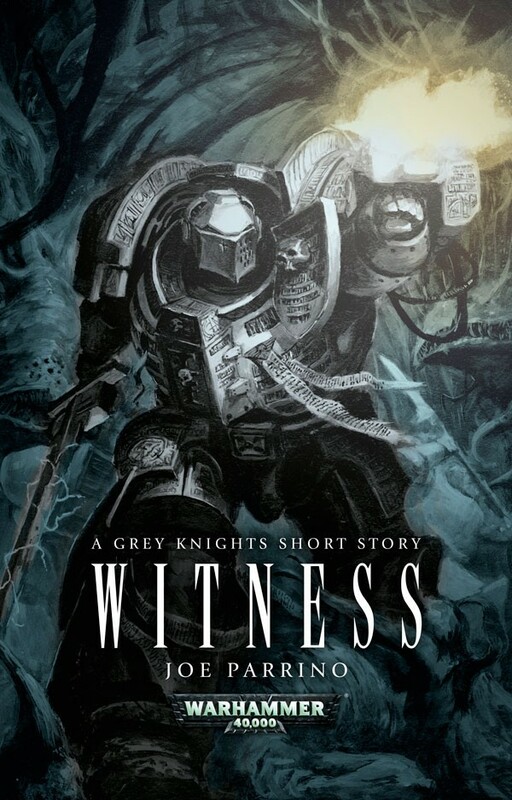 Posted on July 11, 2013, in Debut Authors Guest Series, Guest Posts and tagged Black Library, Debut Authors Guest, Grey Knights, Guest Posts, Joe Parrino, Names, Names A New Perspective, Patient Hunter, Tau, The meaning of Names, Warhammer, Warhammer 40000. Bookmark the permalink. 2 Comments.